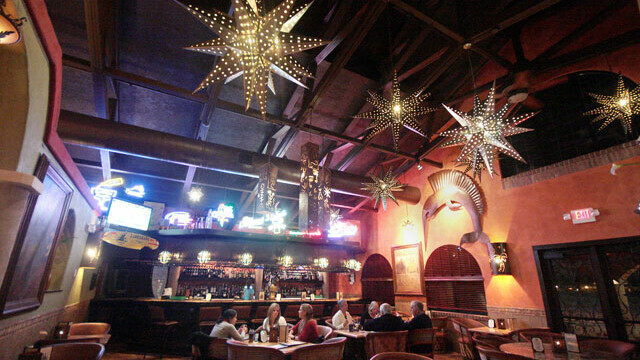 Manny’s Cocina strives to create a grand view of coastal Mexico through its lush interior and succulent menu packed with seafood, steaks, and Mexican specialties. Signature items include the Seven Seas Burrito packed with scallops, jumbo white shrimp, and Mahi-mahi – all covered in jalapeño and chipotle sauces. Locals also love the jumbo crab-stuffed shrimp, wrapped in bacon and grilled. Outdoor seating and party space available. Vegetarian and gluten-free friendly, extended wine listing, and happy hour all day Sunday. Choose from over 20 specialty beers (domestic and imports) or six tap lines at this handsome dark-wood bar within an upscale Mexican restaurant. Daily 3-6pm happy hour applies to margaritas, rail drinks, wine, domestic bottled beers, and appetizers. The setting is spacious with a high ceiling and exposed beams. Enjoy a margarita on their outdoor patio in summertime.